Most of the portable machines that look like this have one motor and usually an AC motor. This is the only machine on the market that I have found that has 2 motors and is a spiral type vibration. This has a plastic shell but has a solid, heavy gauge steel frame beneath. It has a larger surface foot print so it doesn't feel unstable like similar looking models. It weights around 52 pounds (about 80 pounds lighter than the Trio). This is good if you don't need the pole for balance and you want to carry it around or travel with it. THIS HAS A SIMILAR MOTOR AS THE PRO DUO (1.5 HP INSTEAD OF 2HP) BUT IS 400 DOLLARS LESS BECAUSE IT IS MISSING THE POLE. This is just as quiet as the Trio because of its brushless motors. It will start becoming slightly louder for users over 200 pounds just like the Pro Duo. This will give about 2.8 G forces at about 7 hertz (not 2.8 G's that the Trio gives at 27 inches). It will only hold up to 265 pounds with its 25 inch plate. It has the least amount of pop but if you are light weight you will notice the same pop as their more powerful models. Our sale price on new models is much cheaper since the new models came out. I have one demo model. Click the link below to order our demo. The Pro Duo also has a spiral motor but has a 300 and 200 watt motor instead of a 500 watt and 300 watt motor. The power in this one is very similar to the models that have a 500 watt 1.5 hp motor but can hold heavier people. The rail is very stable and is very sturdy at high speeds. This will still work for people that are up to 265 pounds, but gives less pop and more push feel which doesn't create the hydraulic pump like the Trio which has 40% more wattage that doesn't bog down with heaver weights. Just because it can lift 330 doesn't mean it is right for everyone. I do not feel comfortable selling this to anyone over 200 pounds especially if they want to get the results that the Trio gives. Most of the market on the market have are either too jarring as the plates are too short for the amplitude it gives or they don't give a strong enough pop at the initial acceleration of each vibration. If using this for fat loss and bone density and toning, it is fine. 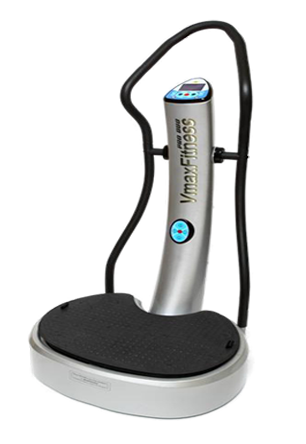 It's jsut for lymphatic drainage you need more amperage to give more G force on the acceleration of each vibration which the Trio does the best. This also has a steel base but a slightly lower gauge than the Trio. The motor is just as quiet also (steel enclosure and also brushless). This also has a large plate like the Trio but shaped differently. The dual motors are also rated at 2HP. 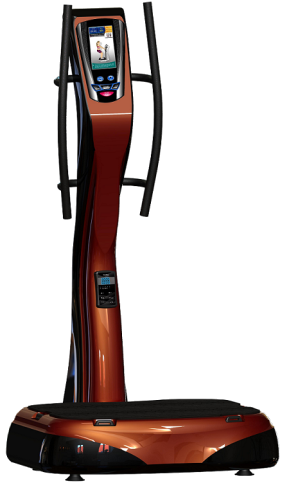 Many of the models in this price range have 1.5 hp, 500 watt AC motors. This models has two DC motors (brushless). This goes from 0 to 50 hertz, with 5 hertz being the sweet spot for lymphatic flushing. It goes to 10 mm in amplitude just like the Trio and holds up to 330 pound people. The plate size is 25.6 inches long, very close to the Trio. It weights 99 pounds, about 30 pounds less due to a smaller motor and a lighter duty frame. Our price is $1799 free shipping. This is the most powerful residential tri motion spiral machine on the market. With dual motors, all the muscles are activated in every direction. For blood circulation, you definitely notice the difference in what you feel like after keeping it on single mode versus dual mode. It's a night and day difference you only have to experience to understand. Although this gives can give the same results as the lighter duty versions in its elliptical style spiral motion, it has a more solid feel and you feel more stable on this one. Most people need 500 watts if the plate is lifting up more weight. This machine will lift 440 pounds maximum with no problem. 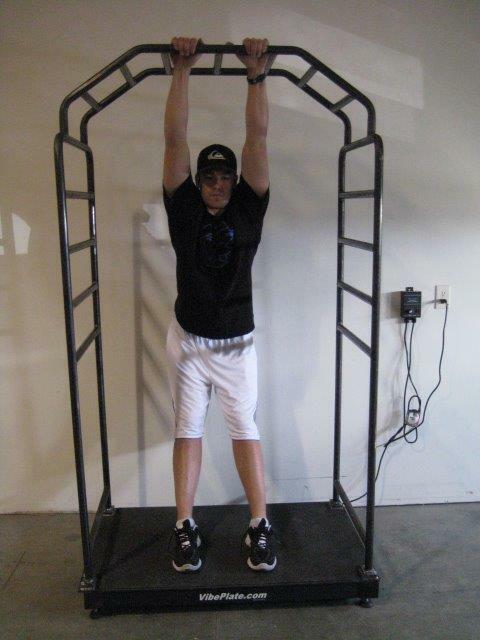 (we tested it and it gave no less pop with a 300 pound person using it for a 10 minute session). The motor didn't even get warm. The big difference you feel is in the hand rail. It is very sturdy while the Pro Duo is a little less sturdy with heavier people. This has the largest 27 inch plate and hits the low 5 hertz that so many machines can't come near. If you wear a size 13 shoe or over you will appreciate the 20 inch front to back length of the plate. Most plates have 14 inch lengths. 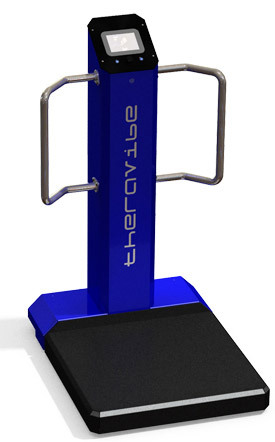 It is not good when your heel comes over the edge or your toes cover of the tip when you are doing dynamic exercises and are moving your feet from the edge of the plate and closer to the middle during your workouts and you have to always be watching your feet because the plate is too short. People love the preset programs so you don't blindly buy this and have to figure it all out on your own. The first motor is 500 watts and the spiral motor is 300 watts. Each motor is 2 horsepower which minimizes the return rate as the motor stays cooler. 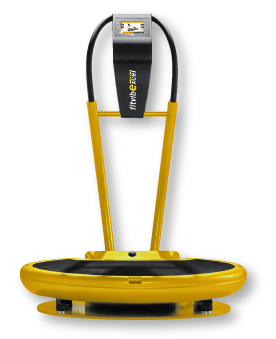 The Trio can go up to 60 vibrations per second and can hold up to 440 pounds. There are look alike models that might have different motors that only have a 330 pound weight capacity. This has a two brushless DC motor and you do not have to have a 20 amp outlet to power it. We give free shipping to Canada and the lower 48 states. ​This machine also includes the straps. If you do not want the freebies we normally throw in we can sell it cheaper. Demos: We have two demos available at a reduced price. Free shipping to Ontario and the lower 48 states. Please call for availability before you buy our demo below. Please see our Vibra-Trim page for our USA VT-400 model. The TRIO ships from Canada. I offer a 30 Day trial on this machine. I have not had a return yet and this is my best selling model, especially in Canada. Adding 3 Dimensional Vibration to standard pivotal plates. Vmax has upgraded their motors and now have a 5 year warranty on their motors. Most companies have a 2 year warranty. Their steel is heavier gauge and their poles are not wobbly. When comparing the sound to other machines, their brushless DC motors are the quietest I have heard. The Trio and Duo were the only ones that can be run all day in a clinic. The other G5 is for residential use as it is a lower wattage motor. With the Trio and Duo having 2 Hp motors, you don't have to worry about the machine turning off from overheating and the automatic cut off switch coming on and you have to wait 30 minutes for it to cool down before using it again. The Trio has a 27 inch plate. You can get about 2.8 G forces when standing near the edge. If you stand at 2 inches closer to the center (which is what happens with most 23 inch plates), you can only get about 1.6 G forces. G force increases exponentially with every inch towards the edge. The Trio comes in 6 pieces so if within the warranty period if something breaks, they just send you that part and you send the broken one back in. You never have to ship the entire machine back. At 5 hertz, the Trio gives the highest G force of all the machines I tested. At this low hertz, you can create that milking motion which gives the valves enough time to let lymph flow in and flush out. Most people have sluggish lymphatic systems. Most vibrate starting out at 10 hertz which is too fast for many people and does not give enough time to create the negative pressure and let waste lymph in and and flush it out. Many companies will try to convince you that higher frequencies are better but rarely people with bad backs and knees can handle those speeds as they can be quiet uncomfortable. I have studied that to fully flush the lymphatic system we need 10,000 steps on uneven ground a day. This doesn't mean 10,000 repetitions on a bike or walking on even ground. Although that pumps the lymphatic system when the muscles squeeze, there is no G forces that make it all the way through the body. Most people store toxins in their fat and as the toxins pump out through the lymph, most people lose weight. This is not by burning calories, the fuel we need when we are sick but toxins. Many people need to preserve their energy. Most people lose weight by burning calories than losing weight by losing weight by getting the 10,000 steps and flushing the toxins that the fat is storing. 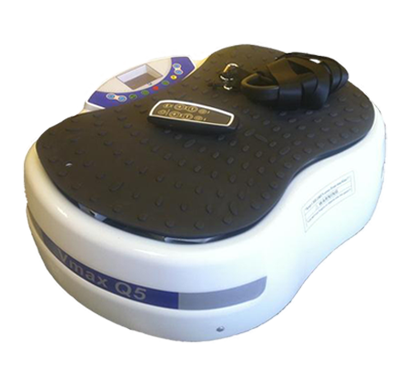 At 5 vibrations a second (300 a minute or 3000 in 10 minutes), you really should use the machine for 30 minutes a day broken up in sessions so you don't flush too much lymph at one time so your liver can actually process it and not dump the unprocessed waste into the gut which can go back into the system and you just wasted your time. These 10,000 steps also is what helps create the high bone density. Look at boxers who constantly hop around when they train and when in the ring. Their bones are very dense. 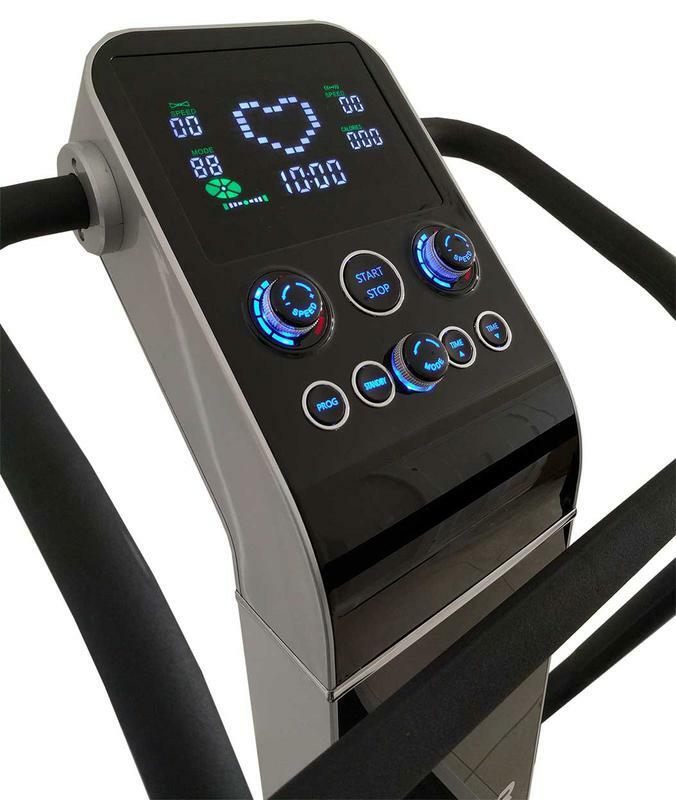 If the vibration is set to 25 hertz, you get more than the 10,000 steps in ten minutes which is why the sessions take so little time for many people to get results. Remember, the slower vibrations are better for creating the negative pressure in the lymphatic system if you want to flush. 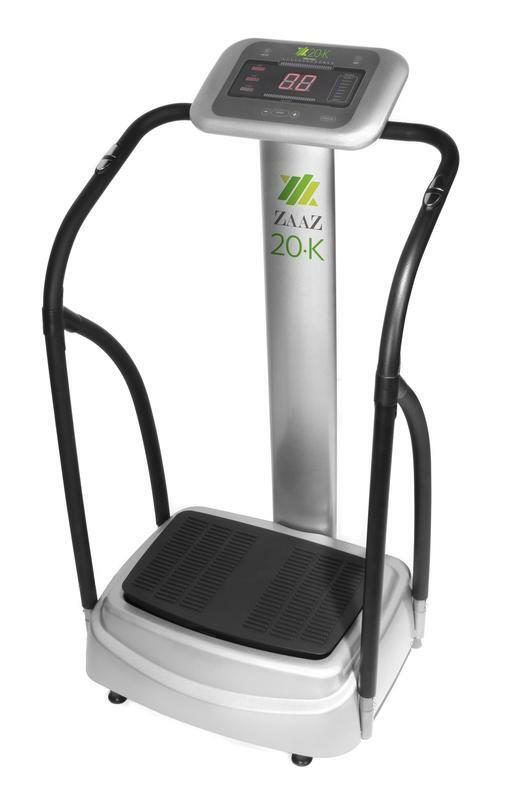 At 3,000 vibrations in 10 minutes, this is equivalent to jogging at a rate of 5 steps per second. On machines that start at 10 hertz (usually much cheaper and have a low G force pop) this gives 6,000 vibrations per 10 minutes. This is like running faster than you can possibly run. Running at 10 steps per second does not give the lymphatic vessels enough time for the one way valves to create the negative pressure to pump the lymph like it would at 5 hertz. 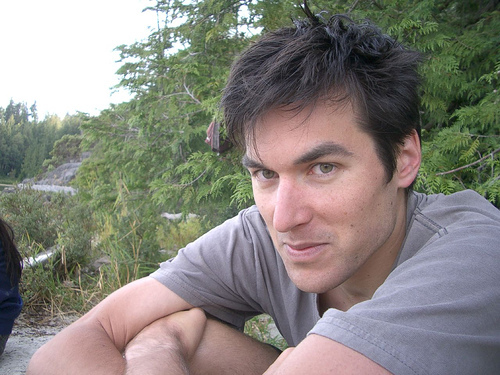 But, at higher hertz (10 and over), this gives the force that we would get if we did this much walking and the force on the bones is what helps build bone density but with machines that start at over 5 hertz the hydraulic pump that needs to be created in the lymph system just isn't there. Lastly, I will say the best machines have the largest plates to give more G force at lower speeds. If you are over 160 pounds I would recommend 500 watt motor, if under 160 a 300 watt motor should be fine. Although a 1.5 Hp motor will lift people over 160 pounds, when you try a 2hp, 500 watt machine next to a lower powered model when you are over 160 pounds, just about everyone prefers the feel of more torque the motor. aIf you want to try this model locally, I have many customers that have agreed to let you try the Trio or Pro Duo in their offices. Call me at 1-866-945-9072 if you want to get our 30 day trial on their 3 machines. 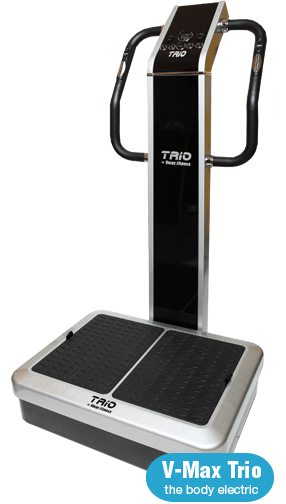 If you want to try this model locally, I have many customers that have agreed to let you try the Trio or Pro Duo in their offices. Call me at 1-866-945-9072 if you want to get our 30 day trial on their 3 machines. If you want help choosing which machine is best for you take my WBV Quiz. Putting a right, clockwise spin on the bottle. Study the affects of a right spin​ on the body. When the body is at a low voltage, it has a left spin, usually with very tired people. We now carry the new New Vmax Pulsar 2. This has a much smoother than the older model we have sold since 2010. We have one demo Pulsar 2 available. 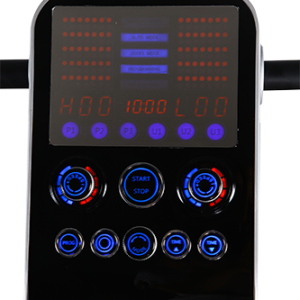 If you would like a discount on the new Pulser 2 on a demo model that was used a few times and still has the 5 year warranty, make contact. Call 1-866-945-9072 to order a demo. ​The Pulser 2 release is now in stock.This is now 3HP and is the strongest spiral model I have tested. I have been using it for about 5 months and it is the most powerful, most stable spiral vibration machine I have tested. It weighs more than the 2nd generation trio and is way more quiet also. The Pulser 2 is very heavy. About 165 pounds. Doesn't shake like the plastic frame models. The dial settings are cool and I don't have to wait to the speed goes up. Just turn the dial and its at that speed. The handlebars are also better. Easier to rest my hands on it. The new motor is much more quieter than the older Trio that came out in 2010. It is much more efficient. They put a very high end motor in it that can drive a true 27 inch plate, not just the outer skirt that you can't stand on like the trio version. The new LED screen is nice also. The screen is 8 inches long. Much bigger than most on the market. The rail also weighs more so it doesn't wobble or rattle at high speeds. It can also hold 440 lbs like the Vmax Trio but this time you can stand closer to the edge. Look at the two pictures and look at the edge of the trio and the edge of the Pulser. Notice the Trio has a 27 inch plate too but the skirt is plastic and you can't stand on it. The Pulser doesn't have that skirt on the edges anymore. I like the programs and I can also program different workouts in it. ​is the Hypervibe or the VivoVibe 460. The amplitude of the edges now go to 11 mm high. The older ones and most on the market only go to 10mm. The extra 1mm makes a huge difference in feel. Not only is it going at 14 hertz per second but at an extra 1mm, its giving the body an extra 22mm of force every second. I have videos of it my Vibra-Trim page for our USA version of the Pulser. 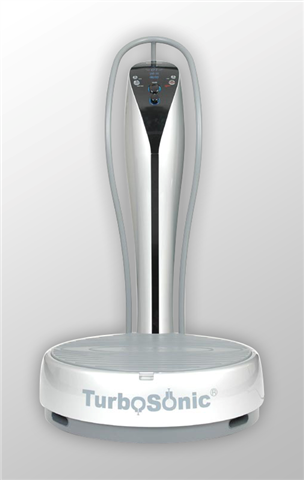 The Pulser 2 ships from Canada and the Vibratrim 500 model ships from the USA. They are very similar. 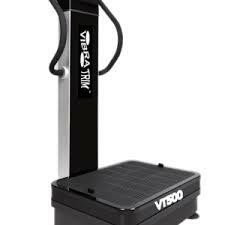 The VT-500 holds 400 lbs and the VMAX PULSER hold up to 440 lbs. Both have a full 5 year warranty. Get 30 days to try it. For any reason you don't like it, I always have a buyer looking for your return. You should never have to keep something if you don't like it. I have two demo Pulsers available. Call to see if we have any specials prices or any demos if interested in a reduced price. If you have an older Vmax Pulser 1 model and want to upgrade, we take trade ins. 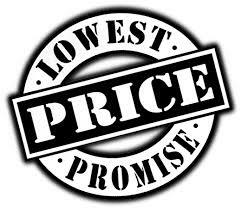 Call to get our lowest quote on a trade in. 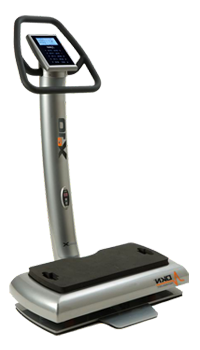 We guarantee the lowest price on the Vmax Pulser 2.